I have mentioned several times the wonderful hill upon which our Harlaxton manor stands. Oh noble, beautiful hill! Rising so beautifully from amidst the surrounding farmland; housing so gracefully our magnificent Harlaxton! But the truth of the matter is that our hill and our manor are not without their rivals, for just five miles west of us rises another hill with another great country house. That manor atop the other hill is known as Belvoir Castle. 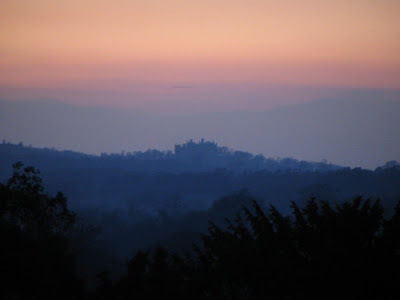 I have seen Belvoir Castle many times before from a distance. 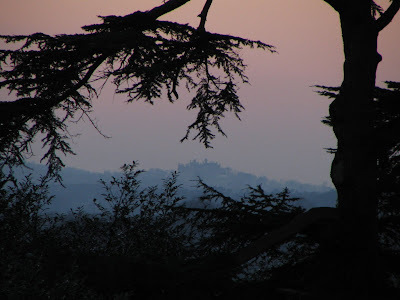 As I would stroll through Harlaxton's gardens in the evening, watching the sunset, I would frequently see a dark shape amongst the trees on the other hill. 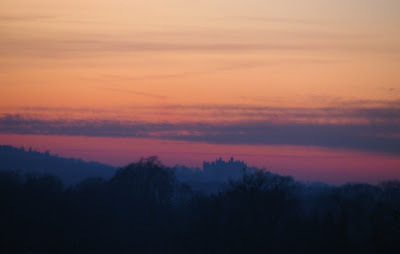 That mystical spectacle, made even more surreal by the colors of sunset, was all that I knew of Belvoir Castle throughout almost two months of glancing at it in the evenings. Then, on the last day of February, our whole British Studies group went on a trip to Belvoir Castle, with a later visit to the thematically-connected Southwell Workhouse. The present-day castle was re-designed and re-built in the early 1800s, around the same time that Harlaxton was constructed. Whereas all the previous Belvoir Castles had been built for the purpose of fortification, there was no longer such need by the 19th century; instead, the present-day castle was built with only beauty and elegance in mind. Thus, the building's style is that of a fairytale medieval castle, with gothic decoration, beautiful arches, sculptures, and, above all, splendor. Wide hallways, tall painted ceilings, and a lavish display of wealth are wonderfully mixed with the coziness of a purely aristocratic home. The Castle is still occupied by the Duke of Rutland (currently the eleventh Duke of Rutland) and his family, though they only live in part of it; the rest of the castle is open for visitors and for occasional meetings/conventions (when we arrived, a whole bunch of Mercedes cars were parked alongside the castle). 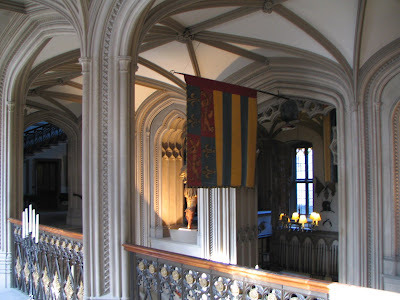 Our tour of the castle, led by a pleasant elderly man who seemed very attached to the Castle and its inhabitants, began in what used to be the servants' quarters and kitchen. As in many stately homes of the Victorian era, there was a sharp contrast between the domain of the servants and that of the masters. The masters’ domain was filled with beautiful decorations, spacious rooms, and tall ceilings; the servants’ accommodations were moderately livable, but they were hidden in areas of the basement and kept relatively out of sight. The best complement for a master was having a house that worked like clockwork, where servants would blend into the background and would appear seemingly out of nowhere only when needed. Hence, because little contact and attachment existed between the families and their servants, masters felt little need to furnish their servants with more than the bare necessities. But what lacked in beauty in the servants' rooms was amply repaid in the rooms designed for the family. The halls and staircases -- that is, the masters' halls and staircases, as servants had their own backdoor stairs and entrances into any room -- were gorgeous. The halls contained many large windows and mirrors to reflect any incoming light, and their arches were of solid monumental rock, much like in medieval cathedrals. 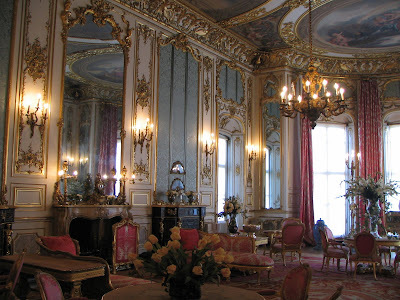 Many of the ceilings were decorated with ornate designs, in particular with golden peacocks -- a long-time symbol of Belvoir Castle. We were led from room to room, each with its own long and unique history. 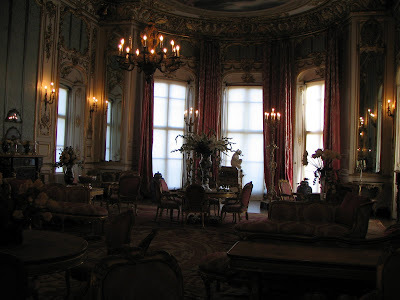 Among the most memorably ones was the Pink Room, with gorgeous (mostly pink and gold) furniture, phenomenal ceiling paintings, a hand-woven ornate rug, countless mirrors, fancy candles, and absolutely royal opulence. The room had a warm charm to it, aided by its beauty, but independent from it -- it had an atmosphere of a living home. It was a fairytale room in a fairytale castle: a castle meant not for defense, but for affluent and leisurely living. From the Pink Room we were led to the State Dining Room with a remarkably beautiful ceiling, composed of hand-sculpted roses. Each rose was slightly different from the next, much like each snowflake has a unique structure of its own, and it was wondrous to gaze at such a remarkable variety. From the Dining Room we walked across to the portrait gallery, which contained a diverse collection of beautiful paintings. One memorable painting was the classic portrait of Henry VIII (so engrained into us during British Studies) -- it is one of several originals (all roughly the same) that were made during Henry's reign. We then proceeded along the spacious halls to a quiet Library, with peaceful lighting and beautiful wooden shelves and carvings. An immeasurable number of ancient volumes were stashed in those shelves, some written in Latin and Old English. The Long Gallery was another masterpiece of the house; like many other Long Galleries in Victorian Britain, its purpose was to allow aristocratic ladies to walk up and down it for daily exercise on rainy days, but this one in particular had been built in a remarkably rich style. Large windows faced the inside garden, a wall-size mirror hung on one end of the Gallery to make the room seem even larger, and comfortable furniture and various fine array had been gracefully placed throughout it. Our tour was concluded by a visit to the Chapel, which had also been built in a fancy gothic style, but felt too stern and cold compared to the rest of the very opulent, yet homely, Castle. After such a tour of a spectacularly rich and beautiful aristocratic castle, the stark contrast of the Southwell Workhouse (about an hour away) was all the more apparent. The Southwell Workhouse was on the other extreme of the have and have-nots spectrum: it was built as a special institution for the old and the unemployed. The idea of the workhouse emerged in Victorian Britain when relief payments for the needy became too expensive for individual communities to support, forcing the government to design a centralized system of help. The government's solution was the Workhouse: a building that housed between a hundred and a thousand old and unemployed people and that took care of them there all at once. The Southwell Workhouse was one of the first workhouses to be built in Great Britain, and was actually rather small, with a maximum capacity of just 150 occupants. To ensure that few people came to the Workhouse unless they had exhausted all other means of securing a living, the workhouse environment was harsh (though not cruel). Much like Belvoir Castle, the Workhouse had a hierarchical system within it: the very best rooms were occupied by the master, who oversaw the workhouses' operations; the unembellished but still decent rooms were occupied by the old and the infirm, who received adequate meals and a fair amount of freedoms; the most basic rooms were given to able-bodied men and women, who were also forced to do mind-numbing labor throughout the day. As such, the needy old were indeed taken care of, but the unemployed (who were assumed to be purposefully lazy by the Victorian society) were discouraged from abusing the relief system. As we walked around the workhouse, the plain rooms, the damp kitchen, and the overall bleak life of people who had been forced to enter the workhouse became all too apparent to me. Few of the families who had come to live in the to the workhouse were actually lazy; rather, they came because they had nowhere else to go, and because the job market was frequently over-flooded with workers during the 19th century. 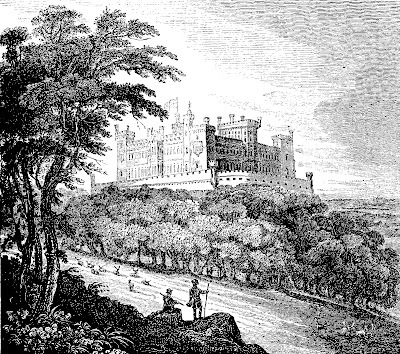 The disparity between the rich and the poor was never more evident to me than in the juxtaposition of Belvoir Castle and Southwell Workhouse: whereas I had previously thought of the 18th and 19th centuries as idealized times such as depicted by the Count of Monte Cristo, I suddenly felt the bitter taste of the less glamorous life. And, as I glanced with new insight at that global picture of historical Victorian Britain, I realized that fairytale manors such as Belvoir Castle were little more than fantasy islands, scattered amongst a vast sea of sweat of the less fortunate Victorian-era men. Thanks for that. I used to work at Belvoir Castle. Hey there bro. Long time no see, ne? The pictures are still beautiful and the posts are still way way too long. Drop me a line, why don't you? See you later (or sooner).